Shop our Colombia football team signed memorabilia with autographed shirts from the team’s players. Most of these items come with absolute provenance – a photo of the signing process. All come with a certificate of authenticity, Free UK delivery and fast worldwide shipping! Like fellow South American football favourites Brazil, Argentina and Uruguay, Colombia is well-known for its love of the beautiful game. FIFA estimates that the country is home to a massive 3 million players – with 2,773 clubs nationwide. Passion for soccer in Colombia is widespread and endemic – with everyone downing tools to support their country with pride during international tournaments. Football in Colombia is thought to have originated in the 1900s, introduced by English railway engineers from The Colombia Railways Company. Fast forward to 1924 and the Liga De Futbol was formed, before becoming affiliated with FIFA and CONMEBOL in 1936. The Colombian National League is governed by the Colombian Football Federation and ranks 9th in the International Federation of Football History and Statistics’ ‘Strongest National League in the World’. The Colombian national team is currently ranked third in the FIFA World Rankings. They’ve impressed over the years in various high-profile tournaments, reaching the FIFA World Cup quarter-finals three times. In the Copa America, they have also excelled, securing a tournament win against Mexico in 2001. Culture-wise Colombia has contributed greatly to the sport. It is home to Rene Higuita, creator of the infamous ‘Scorpion Kick’. The trick (which involves forming an arched handstand to kick an oncoming ball upside down) was voted best football trick in the world ever invented in 2008. His most prolific performance of the manoeuvre was during an international friendly between Colombia and England in 1995. Overall Colombian players have scored a significant impact throughout European Football and Major League Football. Our selection of signed Colombia football shirts, balls, boots & photos is second to none. 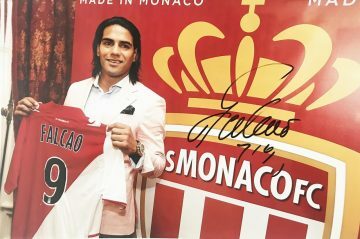 Browse our collections of signed shirts, footballs and ephemera from Colombian football legends including James Rodriguez, Radamel Falcao and Ivan Cordoba. Each item is supplied with a certificate of authenticity for full peace of mind and provenance.